PRAYER PROMPT ••• I have a friend who makes the most incredible cakes. She just shook her head, said it didn’t bother her, while she continued on her work. My friend’s indifference to her edible art’s destruction held a great truth… nothing lasts forever. 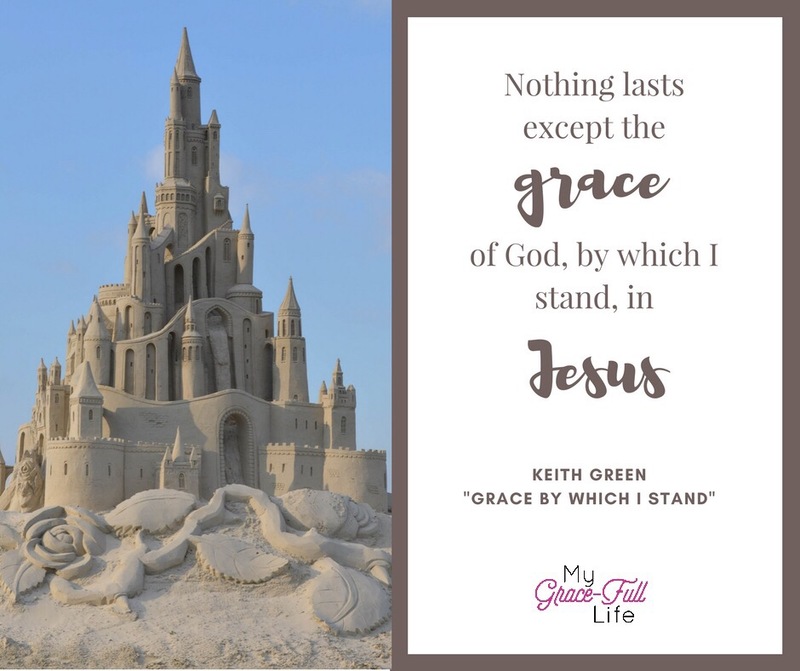 Whether it’s a cake that gets divvied up among the guests, a windstorm that takes out a 100-year old structure, a sandcastle that gets knocked over by the waves, or even our very lives — nothing will last. Except the grace of God. Jesus told the story of building our foundations on a rock verses sand in Matthew 7:24-27. He spoke of needing a solid foundation so when the storms of life come through, we are anchored. Whatever we build in our lives – success, money, possessions – all will collapse if it’s built on the insecurity of the sand, which can be shifted and blown about. However, when we anchor ourselves to the Rock of Jesus, we can stand against any storm. The grace of Jesus — that’s forever. Today, as you pray, ask the Holy Spirit to remind you of this truth, to help you keep in perspective all that will eventually blow away compared to the Rock of Jesus and His everlasting grace.